Editor note: This is an interview with Mr. M. Newman from BRC Lifts, a local fabricator and elevator/lift manufacturer based in greater Sydney area. We saw the benefit of using a 3D CAD system through our suppliers; most of which used SolidWorks. Using a 2D system, we were repeating a lot of drawing tasks especially when changes were required. This created a risk of error and considerable time was needed for not only creating the drawings but checking for errors. While all of our products are custom designed, project-by-project, our product designs were fundamentally the same. We saw the opportunity to almost automate the design process by having standard parts which could be simply altered by changing a few values. This process could drastically reduce drawing turn-around and almost eliminate errors. We also believed a 3D system could expand our scope into more complex components. We considered a variety of 3D CAD systems and Shortlisted both SolidWorks and Autodesk Inventor. While we were already familiar with the Autodesk environment, our decision to use SolidWorks came down to its strong presence in the manufacturing industry and the pricing structure. Despite a larger upfront cost, we were looking at a long-term solution, so a perpetual licence with a smaller on-going subscription was more appealing. SolidWorks is an intuitive piece of software and it did not take long to learn the basics. If there was something specific we needed to do, a quick search in the help menu delivered and we seldom find something we can't actually achieve. The main efficiency are derived through the use of assemblies. 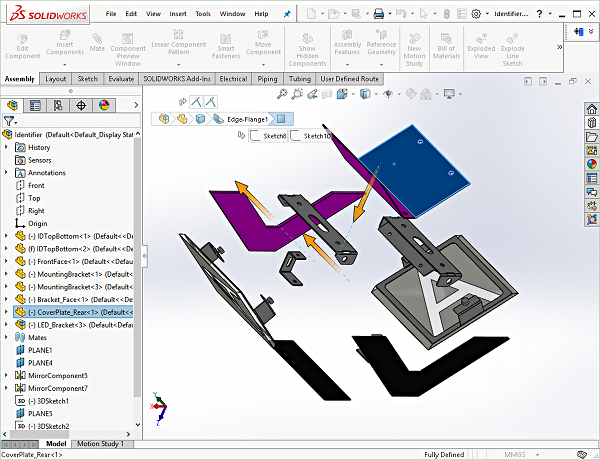 We can make minor changes to parts in assemblies and update associated parts by using constraints. This greatly improves our efficiency in engineering our products. We can also quickly identify if panel components are obstructed through the use of collision detection. This minimises the amount of manual checking and reduces the chance of having to remake parts. Other efficiencies for us include flattening of sheet metal parts and automatic drawing creation from parts and assemblies. Our experience dealing with 3CAD is nothing short of fantastic. With existing subscriptions for other systems in place, 3CAD were understanding that timing was important to us; we did not want to purchase too early yet we wanted a suitable transition period so we had time to learn SolidWorks while still producing product on a familiar system. The technical support at 3CAD has been very responsive and helpful with setting up our organisation with SolidWorks. So far, we have only really had queries on how to complete certain tasks or find particular functions. However, 3CAD have been able to assist 100% of the time. BRC manufacture and install bespoke solutions for all aesthetic aspects and end-user functionality of a lift. This includes the internal lift car finishes, car button/indicator panels and floor call buttons. We differentiate ourselves in the market by providing a complete solution for the lift car where our competitors only offer one component. By offering an all-inclusive service, our customer has a single point of contact from sales through to project management with the benefit of not having to deal with a lot of the technical design process. 3CAD Software serves New South Wales with high-value SolidWorks software and support options for mechanical design. We strive to meet the unique needs of every SolidWorks user. Based in Parramatta, 3CAD is centrally located for convenient access for training and events. 3CAD Software also hosts regular product presentations and tutorials, which are listed on the 3CAD website training page.